With a total of 43 walkers took part on the overall championship, the event ended successfully with a special thank to the schools teacher who have encouraged the students to take part. In March 2014, RWAM has conducted 3 walk clinic around Klang Valley area. Schools that we have being conducted were SM Putrajaya Persint 8(1), 23 students, SRJK (Tamil), Kajang, 42 student, SMK Dato' Ahmad Razali, Ampang, 30 students. Coach by MSN Bukit Jalil, Mr Jagjit Singh & senior walker En Adanan and Cikgu Abas. Thanks to the our sponsor 'Nestle Malaysia' by providing T-shirt & Milo Drink for the students. For more information about walk clinic conducted by RWAM, we welcome primary & secondary schools to approach us by email us or contact Mr Sivam at 019-2272136. 2 2 October 2013, Tuesday. Great initiative from SMK St. Paul schools Head of Co-curriculum Ms. Shantini Lingam by inviting RWAM to conduct a walk clinic for their school. 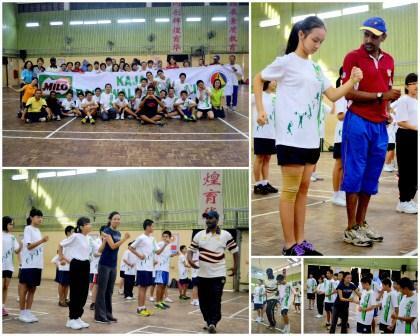 Neighboring Chinese & Indian primary school was also invited on that day to join in the clinic. Total 35 students were coached by MSN Bukit Jalil Race Walking Coach Mr Jagjit Singh & 20 over years experienced in race walk En Adanan. Thanks to the sponsor 'Nestle Malaysia' by providing Milo T-shirt & Milo Drink for the students. 23 Feb 2013, another clinc walk was conducted at SK Jalan Semeyih 2. Total 63 students age below 12 years old has taken part in this menaing full event coached by Malaysia National Walker, coach Yu Fang & Mogan.